The major symptoms that may need management at the end of life are pain, anxiety, nausea, vomiting, secretions and terminal restlessness. There are several symptom assessment tools available. One example is the M. D. Anderson Symptom Inventory (MDASI) developed for use with cancer patients which comprise 37% of hospice patients. This tool measures pain, fatigue, disturbed sleep, distress (emotional), shortness of breath, drowsiness, dry mouth, sadness, difficulty remembering, numbness or tingling, lack of appetite, nausea, and vomiting. It has been tested extensively for reliability and validity (Cleeland, 2009). (sample at http://www3.mdanderson.org/depts/symptomresearch/pdf/MDASI_Core-English%20SAMPLE.pdf). Seventeen percent of these patients (n=9,092) reported having severe pain at admission. Of those patients reporting severe pain at the time of admission, 60% reported a reduction in pain to a level five or lower by the end of the fourth day of care. Twelve % reported their pain level was six or higher by the end of the fourth day of care. Twenty-eight % were unable to report their pain level by the fourth day (DOEA, 2014). Wilkie, et al. (2016) carried out a study to determine the barriers described by both hospice patients and caregivers to pain control. The two highest areas of concern were more pain meant disease progression and lead to constipation. The next three areas of concern were addiction to pain medication and the consequences such as confusion and embarrassing actions. These concerns and possibly those similar ones of healthcare providers need to be discussed openly. No patient should experience pain because of these issues. Cagle et al. (2015) demonstrated the use of an intervention called EMPOWER (Effective Management of Pain: Overcoming Worries to Enable Relief). This intervention staff education, patient and caregiver screening of barriers to pain management on admission as well as identified misunderstanding. Statistical improvement on knowledge, concerns about pain and pain management were shown as a result of this approach. Pain is not simple to define nor quantify. Two people with similar conditions may react very differently. One person may report pain at level "3" on a 1-10 scale and another may report pain at level "8" for a similar injury. The therapeutic response to pain is to assess the effect of pain on the patient's wellbeing, determine the cause of the pain and then treat appropriately. To do that, begin by accepting that the pain is as the person describes it while understanding that many physical, psychological, social, and spiritual factors can affect the experience of pain. When assessing patient pain, it is best to begin by accepting that the character and level of a patient's pain is what he/she says it is. Analgesics should be titrated to pain intensity. Analgesic dosing should provide adequate pain relief with minimum side effects. Step 1 - Non-opioids for mild pain: ASA, acetaminophen, nonsteroidal anti-inflammatory agents (NSAIDs). Step 2 - Weak opioids for mild to moderate pain: immediate release (IR): Percocet, Tylenol #3, Vicodin, Tramadol, Oxycodone. Preemption with stronger opioid if pain expected to worsen . Step 3 - Strong opioids for moderate to severe pain: Sustained release (SR) or transdermal opioid + rescue IR opioids for well controlled pain with breakthrough: morphine, dilaudid, oxycontin, methadone, fentanyl. 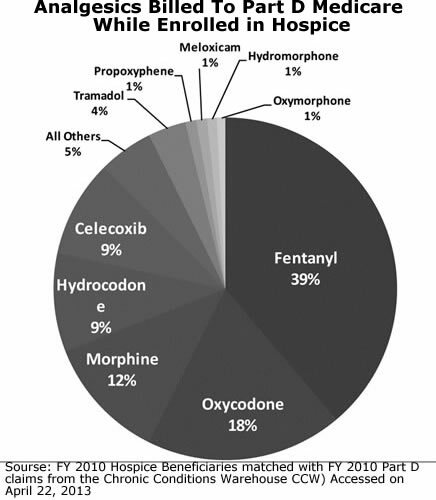 Step 4 - Strong opioids for continuous pain: SR , transdermal & IV opioids , morphine, dilaudid, oxycontin, methadone, non-opioids, adjuvants and interventional techniques. "Adjuvant medications include: steroids, anxiolytics, antidepressants, hypnotics, anticonvulsants, antiepileptic-like gabapentinoids (gabapentin and pregabalin), membrane stabilizers, sodium channel blockers, and N-methyl-d-aspartate receptor antagonists for the treatment of neuropathic pain (2013, Vargas-Schaffer)." Neural ablation (nerve block) can relieve pain for some conditions, and this may allow the patient to have relief of suffering and still retain consciousness as long as possible. More commonly, neuraxial analgesia has been used with intraspinal therapy (intrathecal and epidural) to relieve intractable pain. Palliative Sedation is the monitored use of medications to relieve refractory and unendurable physical, spiritual and psycho-social distress for patients with a terminal diagnosis, by inducing varied degrees of unconsciousness. The purpose of the medication is to provide comfort and relieve suffering and not to hasten death (Hospice and Palliative Care Federation of Massachusetts, 2004). RN assesses during initiation of therapy, every hour until dose is stable after which the RN monitors for adverse effects. There are three main routes to administer long acting pain relief in hospice care: the use of oral medications, the use of pain patches and PCA pumps. These can be used in the home setting and hospice facilities. When transitioning from one oral drug to another, IR to SR or one route to another an opioid equianalgesic conversion chart should be used to calculate the new dose. The maximum analgesic effect is 1.5 to 2 hours for (oral) IR opioids, 3 to 4 hours for (oral) SR opioids and for methadone. Use conversion chart to convert that amount to SR opioid. Anticipate the need for 10 to 20% IR rescue dose. If pain is only partially controlled with an IR opioid, i.e. (pain of 9/10 is reduced to pain of 6/10), the order is for converting from IR to an SR at a higher dose. Calculate total milligrams of IR opioid used in 24 hrs. Fentanyl transdermal patch (Duragesic patches) can provide 72-hour pain relief for opioid tolerant patients. age - 75+ absorbed than less than the younger than 65 group (Solassol, 2010). cancer type - breast CA group absorbed more than lung CA group (Solassol, 2005). drugs that induce or inhibit cytochrome P450 CYP3A4 may alter serum concentration (Muijsers, 2001). After transdermal patch removal, serum fentanyl concentrations decline gradually, falling about 50% in 13-22 hrs. Duragesic patches are available in 12, 25, 50, 75 and 100 mcg/h dosage (Muijsers, 2001). Dosing should be calculated using an opioid dose conversion table. The patch is placed on normal, unshaven skin. After 72 hours the patch is changed as well the as location. When break through pain increases, the dose of the next patch is increased by the calculated dose required to cover the break through pain medication. Intravenous pain medication is usually reserved for continuous management of extreme pain or when the patient is no longer mobile or alert. Opioid pain medications are considered high-risk medications due to the potential for respiratory depression and other adverse effects. Naloxone to reverse opioid toxicity should be discussed with the patient and family. Patient's advance directive and DNRO should document the patient's acceptance or refusal for naloxone rescue. All patients should be screened for depression and other mental health disorders, as part of risk evaluation. Most opioids are metabolized in the liver and kidneys, disease in these organs will affect the serum concentration. The so-called fear of death may in fact be fears about the actual dying process, of not existing, of the moment of death, of pain and suffering, and especially of breathing difficulties and choking, of isolation and abandonment, of a loss of control, of disfigurement, of being a burden, of unwanted dependency, of being unable to complete important tasks and responsibilities, of being dead itself, even of being afraid of the fear that may be apparent in the eyes and conduct of others (p.36). It is important for the hospice team to assess what type of fear troubles the patient and if he and she wishes to speak of the fear. As Kellehear says the above list is not exhaustive. Here is a case description of a patient recounted by a nurse. Mrs. G was incredibly ill. Everyone expected her to die within 24 hours. A week later she was still holding on. She was agitated, constantly trying to get out of her bed despite her frailty. One day, her daughter sat down on the bed and said, “Mom, are you afraid of dying?” Despite her delirium, the patient clearly said, “I am terrified of dying. I don’t want to meet my relatives.” She had had a bad experience early on in life and was really concerned that in the afterlife she would be faced with family members she did not want to reconnect with (p.36). Not all hospice patients are afraid of dying. Patients who have had a near-death experience often have lost their fear of death. Lawrence (2015) studied the fear of death of patients who were on a hospice program and had previously experienced an NDE. The purpose of the study was to determine if at the time of death, NDErs still had no fear. All three individuals interviewed showed no fear of dying. One said he could not wait to feel the same way he had felt during the NDE. What is important is to ask how patients are feeling and if they want to talk about what is bothering them. We should not automatically categorize patient’s feelings before doing that. For patients who do have significant anxiety and restlessness, Lorazepam (Ativan) is often prescribed. Here are some significant facts about Lorazepam use. It is best used before symptoms become severe. Lorazepam can increase the effectiveness of morphine and increase sedation. Lorazepam tablets can be placed under the tongue or in the cheek for absorption if the patient can no longer swallow. Nausea and vomiting can be managed by medication. Prochlorperazine (Compazine) is often prescribed. It can be administered by mouth or rectally. It also can produce increase in sedation. Nausea and vomiting often precedes the need to stop intake of fluids and food. This is often a difficult step for the patient and particularly the family. Food is culturally tied into providing love, comfort and sustenance. Family members will often have concerns about their loved one not eating. They may ask about artificial nutrition and hydration, such as intravenous fluid and feeding tubes. They may ask if not eating or drinking is painful for the patient (WHO, 2013). The American Hospice Foundation (AHF) suggests the following information be shared with family members and patients if conscious. Artificial nutrition and hydration can be necessary to sustain the terminally ill patient. However, in the case of the frail and extreme elderly the benefit must be weigh against the risks. Family members who are concerned about nutrition and hydration need to be informed that dehydration in a terminally ill patient is not painful. Small amounts of fluids or ice chips can alleviate thirst. Dehydration also can help reduce secretions and reduce nausea and vomiting. About 50% of dying patients experience breathing noise caused by upper airway secretions. This can be distressing to the family members. The presence of these upper respiratory secretions usually indicate death will occur in a few days. Repositioning the patient often is helpful and eliminates the noise. The patient should be positioned on her or his side with the head of the bed elevated. Good mouth care is also helpful. Family members may ask about suctioning. Usually suctioning is not necessary and may cause distress in the patient. Also hydration with parenteral infusions may increase the amount of secretions. Anticholinergic medications (e.g. atropine) can be helpful in many cases to reduce the secretions and noise. Atropine drops can be administered in the mouth or under the tongue. The terminally ill patient may benefit from sedation, neural blockade or neuraxial analgesia to control intractable pain. Cagle, J.G., Zimmerman, S., Cohen, L.W., Porter, L.S., Hanson, L.C. & Reed, D. (2015). EMPOWER: an intervention to address barriers to pain management in hospice. J Pain Symptom Manage. 49(1),1-12. Cea, M.E., Reid, M.C., Inturrisi, C., Witkin, L.R., Prigerson, H.G. & Bao, Y. (2016). Pain Assessment, Management, and Control Among Patients 65 Years or Older Receiving Hospice Care in the U.S. J Pain Symptom Manage. 52(5),663-672. Cleeland, C. (2009). The M. D. Anderson Symptom Inventory. The University of Texas MD Anderson Cancer Center. www.mdanderson.org/symptom-research > Symptom Assessment Tools. Hospice & Palliative Care Federation of Massachusetts. Palliative Sedation Protocol, A report of the Standards and Best Practices Committee Hospice & Palliative Care Federation of MA April 2004. Kellehear, A. (2014). The inner life of the dying person. New York: Columbia University Press. Muijsers, R. B., & Wagstaff, A. J. (2001). Transdermal fentanyl. Drugs, 61(15), 2289-2307. Vargas-Schaffer, G. (2010). 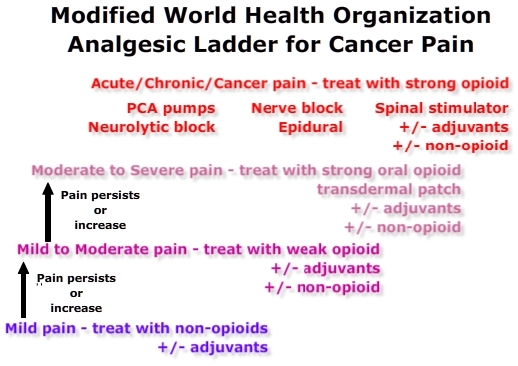 Is the WHO analgesic ladder still valid? : Twenty-four years of experience. Canadian Family Physician, 56(6), 514–517.